Apple Mac users can no longer afford to ignore the threat of malware, according to security firm Sophos. The discovery of a new version of the OSX/RSPlug trojan horse targeting the Mac OS X operating system means Mac users need to be on their guard. "Mac users are gambling with the security of their data if they believe they are immune from threats," said Graham Cluley, senior technology consultant at Sophos. The Trojan is being distributed through a legitimate-looking website that offers software it claims will help users watch high-definition TV. 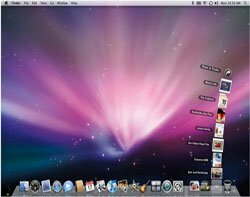 "Mac users are no different to Windows users when it comes to falling for social engineering tricks," said Cluley. Windows users should also be on the look-out for this social engineering trick, which the criminals are using to target Windows operating systems as well as Mac OS X. The malicious website is set up to deliver malware from the Zlob family of malware to users running Windows. Zlob featured in the top ten web-based malware threats in mid-2007. "Once a piece of malware like this is in place on your computer, it can do whatever the hacker wants it to do," said Cluley.